New ashram. New revelation. This one uses mandalas. Having something to look at changes the experience completely for me. My mind still wanders but it wanders more into the realm of fantasy than my earthly problems, blames, etc and a little bit into philosophy but only a little. And this guru told me the wandering is part of the experience. It’s a kind of gift, he said, that each time your mind wanders you have the opportunity to return to meditation. And the more times you return to meditation the easier it will be to return again in the future. Interesting way to think about it but even better a good way to quit beating myself up about failure. Ominous mid-sentence journal entry cutoff! EEK! Well played, but I don’t have to like it :) Now I’m going to fret about Ziggy all weekend. I’m hoping it’s just a glitch. Really hoping. Otherwise, well-played but soooo unfair on a Friday. It’s not a glitch. That’s where he stopped writing. Despite the glitch (Ctan: if you’d meant an intentional interruption, you would have used elipses, right…? ), this was one of the best posts ever. 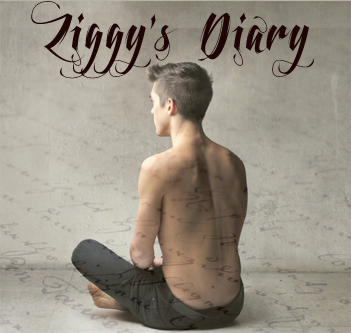 It’s a real insight, both for Ziggy and all the rest of us, to understand that even calamity and conflict open the door to deeper understanding and even, eventually, peace. Great entry. It’s intentional. Since what we’re seeing is what Ziggy put on the page, he didn’t use ellipses. He just stopped writing. He’s been sort of blithe about his chase for enlightenment up to now. But he’s starting to realize some things about himself and how he’s affected the people around him, and those epiphanies can be shockingly painful.